The Native Judges And Officers Of The Court Of The Recorder at Bombay. 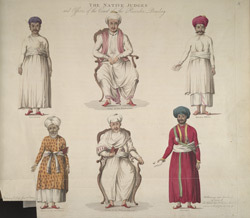 bl.uk > Online Gallery Home	> Online exhibitions	> Asia, Pacific and Africa Collections	> The Native Judges And Officers Of The Court Of The Recorder at Bombay. Picture of six 'Native Judges and Officers of the Court of the Recorder, at Bombay', at the beginning of F W Blagdon's book, 'A Brief History of Ancient and Modern India'. According to Blagdon, these drawings 'were taken from life in 1758' and are labelled respectively as holding the following positions. '1. Judge of the Hindoo Law, Antoba Crustnagee Pundit. 2. Interpreter, Rhowangee Sewagee. 3. Hindoo Officer, Lellather Chatta Bhutt. 4. Judge of the Mohomedan Law, Cajee Husson. 5. Officer to the Mooremen, Mahmoud Ackram of the Codjee order or priesthood of the cast of Moormens. 6. Haveldar, or summoning Officer, Mahmound Ismael'.